Flo’s Diner is full of customers and she needs your help in order to keep up! Click here to play! Help Flo serve up her meals and you’ll be handsomely rewarded. Flo is running the show in this traditional 3 reel game. Spin her symbol across the single payline to bring in the top payout of 2400 coins. You’ll also need to spin in the food, including ice cream sundaes and doughnuts. If you can gather three of the former on the payline and you’ll get up to 150 coins. If you can spin three of the latter, you’ll get up to 60 coins. There are also single BARS, which will earn 30 coins. Be sure to bet the maximum of three coins in order to activate the highest paytable. 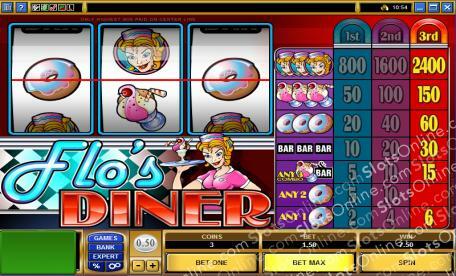 Coin values are adjustable, making Flo’s Diner suitable for all pocket sizes. Can you help Flo serve her customers? Spin the reels to find out!